Getting fit and stay healthy is what we all want. Unfortunately, it is a bit difficult to get right food and right nutrition at the right time in our busy routine. Example: if I am hungry and don’t get some nutritious food at that very moment, I tend to gobble down something junk. It does fill my tummy but with empty calories. As a woman and Mom, I think our tribe needs to remain on toes 24X7 and must take care of health more proactively. 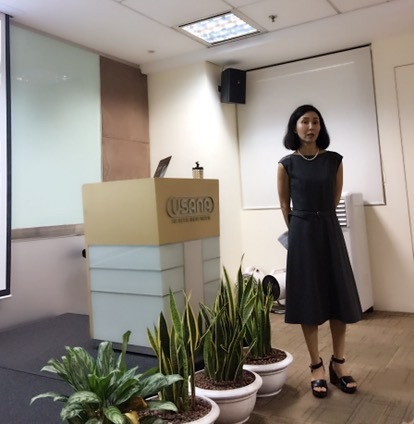 Recently, Usana, a manufacturer and distributor of innovative, quality scientifically-­‐based nutritional supplements and personal care products launched a first-­‐of-­‐its-­‐kind health shake that can be customized to individual health needs. 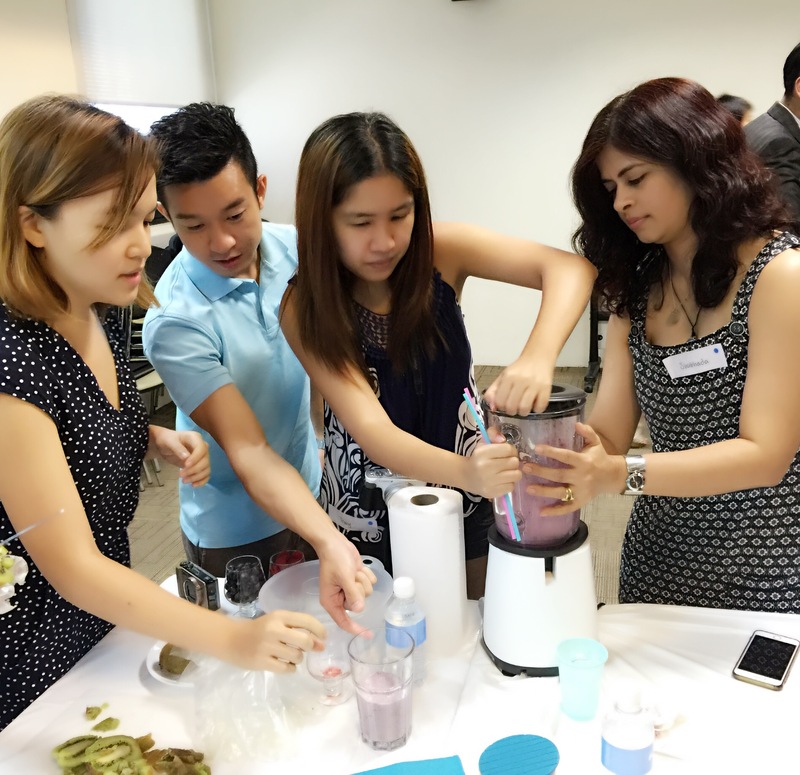 I attended media launch event of USANA MySmartShake and have been trying it out since then. I found it to be a very smart way to get essentials for the body in an easy and convenient way! I love media launch events – I get to meet n mingle with fellow bloggers and we learn about important products while having fun. USANA media launch was one such launch. Everything about it was healthy – right from the session about health, health-oriented activities and nutritious food they served during the event. In addition to vitamins, minerals and antioxidants, our bodies also require macronutrients i.e. protein, carbohydrates and fats. All Fats are not bad and they are in fact essential for bodies to provide essential fatty acids. 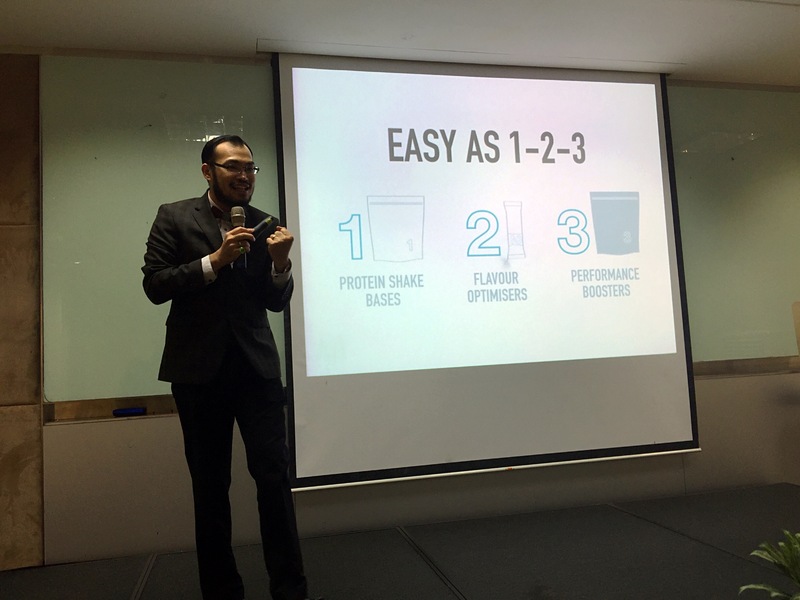 Fats also help with the absorption of fat-soluble vitamins, such as Vitamins A, E & D.
Here is Kenny Tan, Regional Senior Nutritionist @ USANA introducing MySmartShake. Simply putting, USANA MySmartShake is a Smart Solution to a great health. 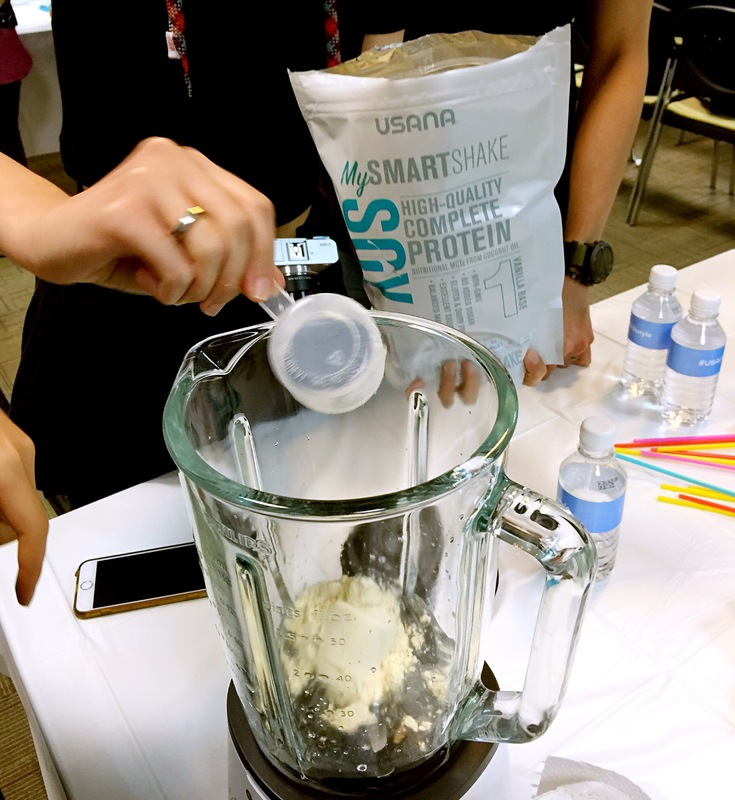 Whether you want to lose / maintain weight, whether you want to build muscles, whether you are a male or female, USANA MySmartShake can be customized to meet everyone’s nutritional needs and promote balanced diets. 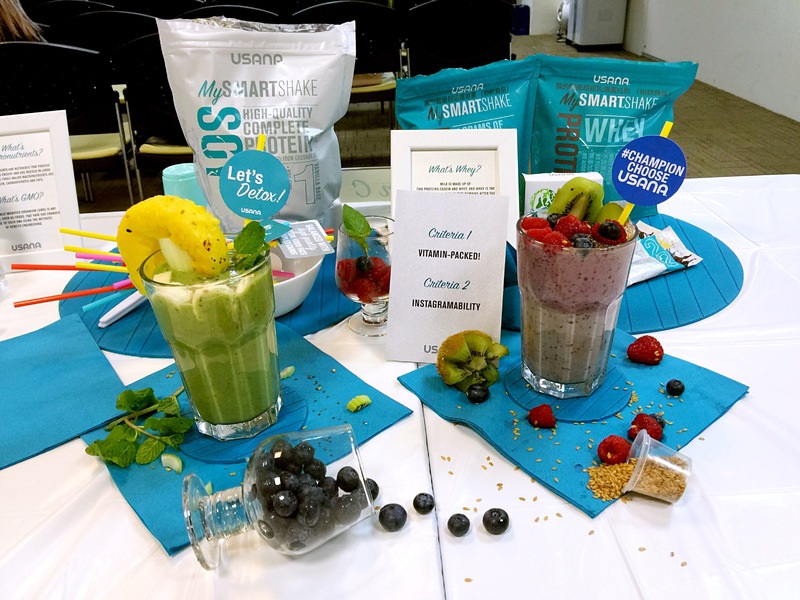 MySmartShake has proteins, it has simple carbs and healthy saturated fats of coconut oil, NO refined sugar. Just 3 steps and tasty MySmartShake is ready! Choose MySmartShake Protein base – It comes in Whey or Soy format. Add MySmartShake Protein Plus Booster OR MySmartShake Fibergy Plus Booster – The booster adds required amount of protein or fiber to suit your active lifestyle. Choose Flavor Optimizer – to make MySmartShake tastier! Dark Chocolate, Cappuccino, Banana, Orange Creme are the yummy flavors you can try out or just skip this step and you get the mild vanilla flavor of the base. After the informative and eye-opener session, we were divided into different teams and the challenge to make the best possible nutritious and Instagram-worthy milkshake was thrown to us!! 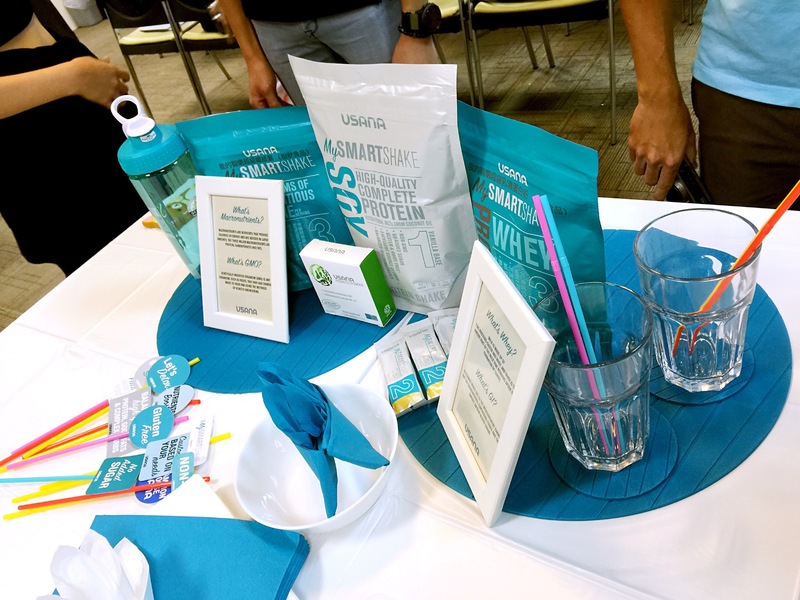 Here are the packs of USANA MySmartShake provided to us: the base, the Fiber and proteins and the flavors chocolate and orange creme. For our second shake, we decided to add veggies like leafy greens and celery and gave it a twist by adding a few fruits! We also added USANA Probiotic powder inside. Needless to say that the final outcome was not only good looking and tasty but full of goodness of MySmartShake combined with veggies and fruits!!! This is my set of USANA that came with this nice shaker which I can carry even when I am on the go!! Add Fibergy Plus Booster – The booster adds required amount of protein or fiber to suit your active lifestyle. Delicious Healthy MySmartShake is ready! It can be used as a meal replacement too. 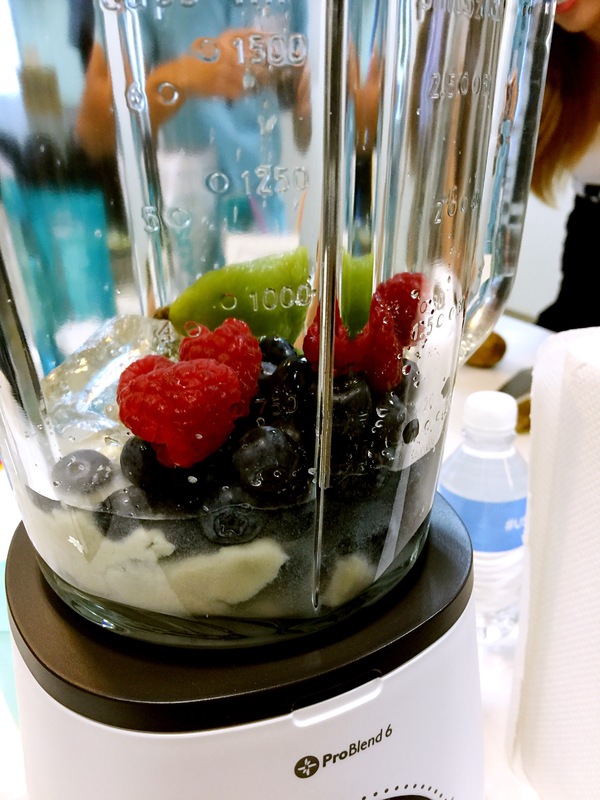 You can also make delish smoothies with USANA MySmartShake. Want to know more about USANA? It’s easy to opt for the less healthy option when hunger strikes and packaged goods are the only thing in sight. But even decadent snacks, like cookies and potato chips, won’t keep you full for long. Avoid snack urges by loading up on high-protein meals , which will fill you up and keep you satisfied for at least a few hours. I have tried Usana products and I love their fiber. Is a good products to keep me healthy and i manage to lose weight after consume USANA. Thanks for sharing about this interesting health product. For the fact that its convenient to prepare easily attracts me to try it out. The brand name sounds new tho! I’m sure it will gain relevance in the market. It is getting easier for busy folks to grab a nutritious meal. Sounda good!! It will still work without a blender right? Might try since I am looking for something similar. 🙂 thanks for sharing ! USANA products are the best for it gives positive and healthy well-being for users. Got to know this product with my friend. Nice! The shakes looked really delicious here and the packaging is very nice! I like that there’s a flavor optimizer. Sounds like it’s def. worth trying. I tried this brand’s nutrients before.. Looks nice and taste ok.. Not bad really! Mmm the fruit smoothies look so yummy too!! Bonus that it’s so nutritious! Never came across this brand till now. Looks easy to prepare too. worth trying. I guess I have no more excuse not to loose weight!! Never heard of this brand before. It looks good and easy to drink on the go for busy people. I love making smoothies especially during busy mornings when I don’t have time to make a decent breakfast. It’s so easy to do and it’s nice that we now have an option to add something even more healthy! This product sounds awesome! With all those fruits, I bet that smoothie would taste excellent. I am most curious to try out the all-berry version of a smoothie. That sweet-sour taste is excellent! It’s nice to see USANA creating tastier ways to bring in their nutrition. My Smart shake is easy to prepare and would be a good meal supplement. This is a new product to me. The problem with me is how I don’t have the patience to do all these blending and mixing even. It looks really delicious especially the one with raspberries! Antioxidants! I’ve tried this before. or any kinda shake. I think it’s a good healthy replacement for full meals but it’s too much work for me hehe. 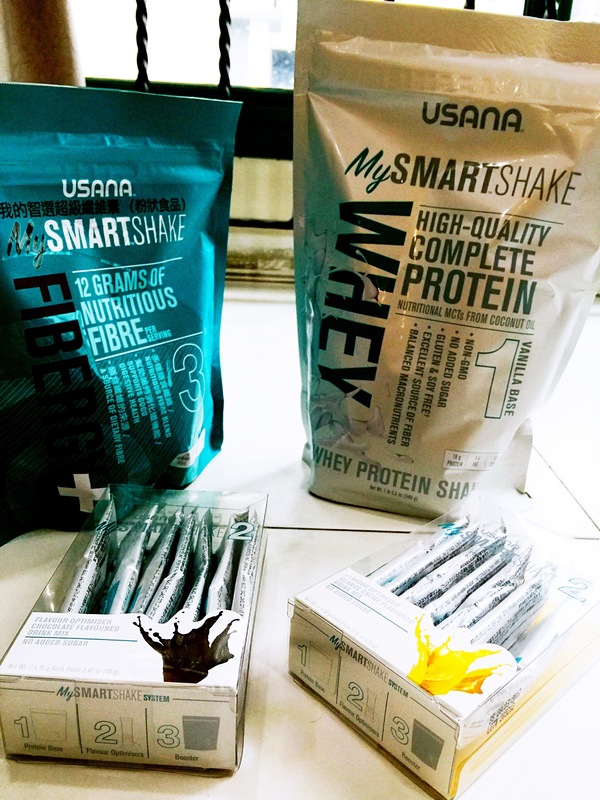 I want to keep my weight with the help of USANA, wish to try out MySmart Shake! Nice! I used to do that when I was a kid. It was so yummy and healthy. This brand has been in the market for a long time..but just know they have such products..
looks like such a healthy and yummy shake… I would definitely love to try this out….. I don’t usually like shakes, but I have to admit that the fruit added to it makes it look appetizing! Shakes are good for weight loss, but I don’t know if I can stomach much of them. I’ve tried drinking shakes. Not all of them taste good. This one probably does especially the chocolate flavor. The shakes you made look yummy. I looked at the website and the price seems to be cheaper than the BeachBody shakes. And Dr Oz seems to endorse this. I think it’s worth trying. Such a yummy blend of fruits and protein powder! It makes for a good meal replacement that is so easy to digest. That is alot of fruits!! 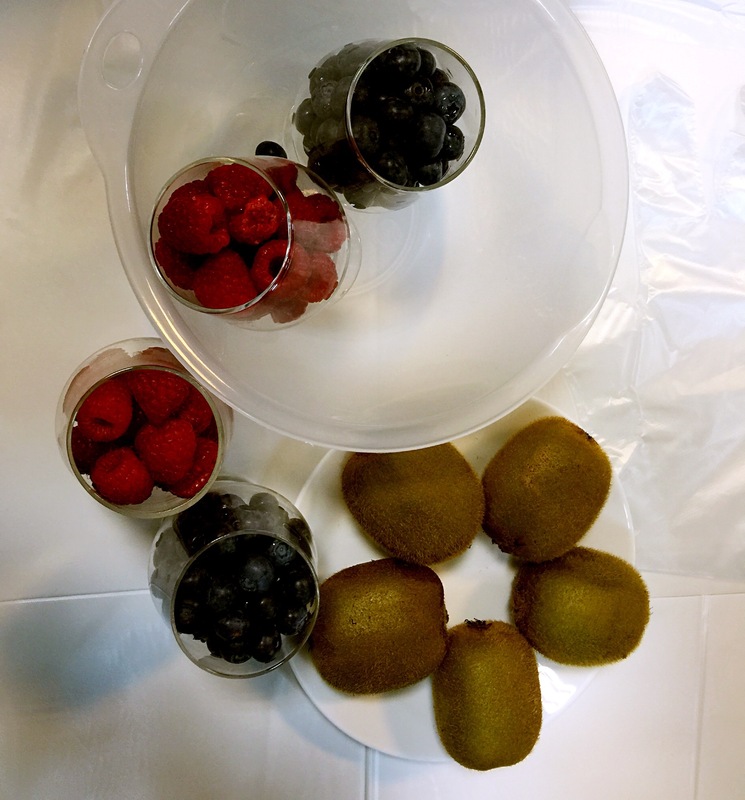 What if I can’t get hold of so much fruits, is it still yummy? This is my very first time to know about this product. Really look healthy and a good product for me for good digestion then. I’ve heard of this before but I haven’t tried this. Another company gave me something similar to this but I still have to get used to the taste. Whenever i get busy I just forgot about my diet and so on.Thanks for reminding me via your this article.Thank you. Such shakes are all you need to keep yourself going for atleast half a day… With mixed fruits I’m sure its yummy. haha, i see familiar faces in your pictures! i’m not a protein shake person, because i feel even though it’s marketed to be a fuss free, convenient healthly alternative, it actually isn’t that convenient, especially for those always on the go. plus it takes some effort to play up the recipe so that you won’t get sick of the taste. wow…it looks so nice!!! I also taking USANA for my health!! Every time I get into a ‘busy’ mode, my diet is the first to go, and then my sleep and health. Thanks for this timely reminder that we don’t have to sacrifice our nutrition even when we are busy. I tried their other product before. Not bad though. This product is new to me. Wow! I think this is the perfect partner I need for my weight loss journey.